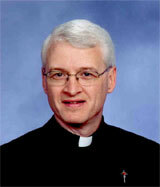 It is a joy for me to be serving as pastor of St. Joseph Parish. Originally from St. Joseph Parish, Wapakoneta, Ohio I earned a bachelor’s degree in Philosophy from Saint Joseph College, Rensselaer, Indiana in 1984 and a Master of Divinity degree with a specialization in Liturgy from Catholic Theological Union in Chicago, Illinois. After being incorporated into the Cincinnati Province of the Missionaries of the Precious Blood I was ordained a Catholic priest in 1989. Following ordination I served in parish ministry until 1993 when I was asked to serve as Director of Vocation Ministry for our Province. In 1998 I was elected to serve as the Provincial Director of the Cincinnati Province of the Missionaries of the Precious Blood and continued in that role until 2010. Growing up in Wapakoneta as one of eight children my siblings and I learned to love and care for God’s creation and to do our best in study, work and play. My personal interests are in working with flowers and music. As pastor of St. Joseph Parish I am also pastor of Holy Trinity and Emmanuel Church which forms Pastoral Region 7 within the Archdiocese of Cincinnati. I see our parishes as the Catholic campus of downtown Dayton. Motivated by the Spirituality of the Precious Blood of Jesus we are called to be people of hospitality, reconciliation and hope. I look forward to seeing how the Holy Spirit will work within our parish and pastoral region to reflect the generous response that St. Joseph made with his life in saying yes to God’s plan of salvation!